Cajun shrimp with cheddar cheese grits is an easy to make dish that brings all the flavors of the Lousiana bayou to your kitchen table. This Cajun Shrimp with Cheddar Cheese Grits is a tried and true favorite recipe that I got decades ago from my dear friend Leigh Ann, one of the best cooks I know. This recipe was the featured dish at many of our church’s “Ladies’ Night Out” and is still one of my go-to recipes today, especially for entertaining. The ideal shrimp for this recipe should be raw (uncooked), either fresh or thawed from frozen. I typically keep a bag of raw tail on shrimp in the freezer for quick and easy shrimp dishes. The shrimp thaws overnight in the fridge or in 30 minutes or less under cold water. Be careful not to overcook! When the shrimp changes color from grey/white to pink, it is done and should be removed from heat. It will continue cooking somewhat even after being removed from oven or skillet. If you prefer making this shrimp in a skillet, it will take much less time to cook~roughly 4-5 minutes over medium heat. If you try this, please let me hear how it turns out. As always, thanks so much for stopping by. Be blessed, and stay savvy!!! 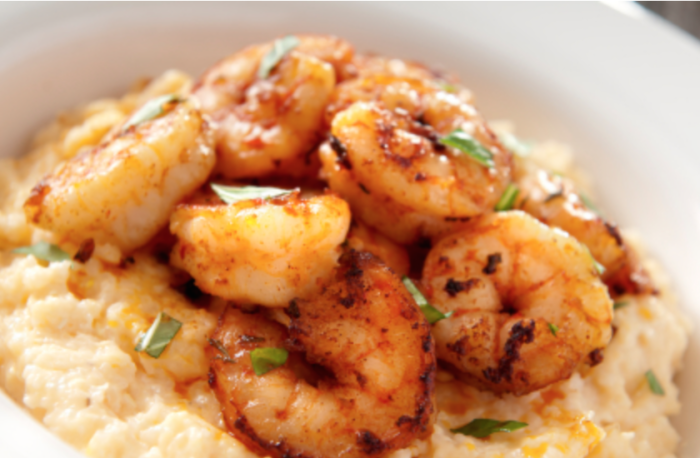 Truly a company worthy dish, Cajun shrimp and cheddar cheese grits is spicy, savory, and scrumptious! Arrange shrimp in single layer on shallow baking pan or cookie sheet. Combine all other ingredients; pour over shrimp, and toss to coat. Bake at 350 degrees for 15 to 20 minutes, being careful not to overcook. Bring milk and garlic powder to a boil in a large saucepan. Stir in grits with wire whisk. Reduce heat to low; cook 5 minutes or until thickened, stirring often. Add cheeses, stirring until melted. Serve shrimp atop grits; drizzle sauce over. Be very careful not tov overcook the shrimp, or it will be tough and rubbery. Hi Robby! I am sure that the sausage(s) will add huge flavor, and your Cajun cooking experience will surely be helpful in creating a fabulous version of this dish! Please share with the rest of us what you end up with!!! Hi Jamie. I’ve been looking for a “different” grits recipe for shrimp and grits and I love the thought of adding cheese as well as going all milk instead of a milk/water combination. I have a few ideas of how to “Cajun” it up a bit more with some local andouille/tasso and I use shrimp straight from the gulf. I love grits and I cook in some small fundraiser type Cajun cook-offs. I’ll have a few test runs for the family to see how they like it but I have a good feeling about this one! Hi Andy! That sounds like a great alternative way to cook the shrimp; thank you for sharing!!! !I am so glad you enjoyed the dish. Blessings to you!!! Thank you for sharing this recipe. I did use the directions to make the grits and for the shrimp I used the same ingredients and preparation. Only I sauteed some onions, garlic, butter, and then cooked the shrimp that way. It turned out really well and my fiance and I really enjoyed it. The meal was filling and delicious. Thank you again for taking the time to share this recipe. Oh I am SO happy that you loved it!!! I am with you; I love spicy and often add more seasonings to up the heat:-) Thank you so so much for your comment. Blessings to you!!!! Omg!! This was soooo..delicious. my whole family loved it. I kicked up the spice a notch because we love spicy food. Thanks for the recipe it’s a keeper. I made the shrimp and grits for dinner tonight and my three children loved it, it was delicious. Hi Syliva! Thanks for sharing! I’ll bet the cheddar will be a yummy substitute. I’d love to hear back from you on how it turns out. Thanks for being a reader!!!! I made this for my grand kids, I wanted something different for breakfast. The kids enjoyed it, but I didn’t like the cream cheese in the grits. I will make this recipe again, but will not use the cream cheese in the grits; I’ll just add more cheddar cheese; perhaps Colby & Cheddar Cheese. Overall the shrimps were perfect. Thanks.